I can bet that most people who listen to my podcast program are looking for ways to attract more abundance into their lives, be it partnerships, resources, money, happiness, health, love and the list goes on. 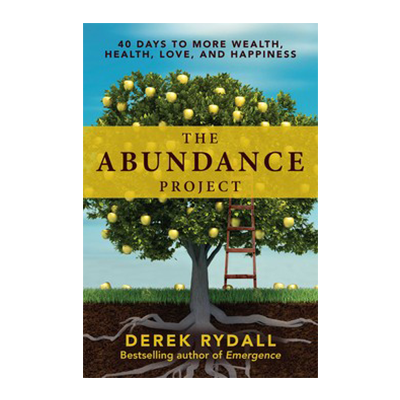 In my podcast interview with author Derek Rydall we discuss his new book entitled ” The Abundance Project-40 Days to More Wealth, Health, Love and Happiness“. What Derek reveals is that their are basic abundance activators, and these transformative concepts allow you to unlock your “inner storehouse of riches”. We discuss many of these activators, but they include: Giving Out, Giving Away, Giving Up, Giving In, Giving Thanks, Giving to Yourself, and Forgiving. Derek offers time-tested systems for activating “The Abundance Principles, which frees us from the belief that outer conditions determine our life and empowers us to achieve our dreams from the inside out. Not matter what your personal circumstance or challenge there are easy steps you can take toward generating real-world abundance in every area of your life. I hope you enjoy this great interview with author Derek Rydall. You can learn more about his new book “The Abundance Project” by clicking the book link.